Plantronics B825 Voyager Focus UC Duo Bluetooth Headset with Active Noise Cancelling | Avcomm Solutions, Inc.
Make your move with the Plantronics Voyager Focus UC stereo Bluetooth headset. Offering seamless connectivity to your PC or smartphone, and integration with leading UC applications, it's ready to work how you do. With up to 150 feet of wireless range, enjoy mobility while calls and music stay crystal clear, whether you're at your desk, in the conference room, or in the kitchen. And with both active and passive noise cancellation, sophisticated mute controls, three precision-tuned microphones and high-definition stereo sound, enjoy freedom with no loss of fidelity. Make it your business to hear and be heard. 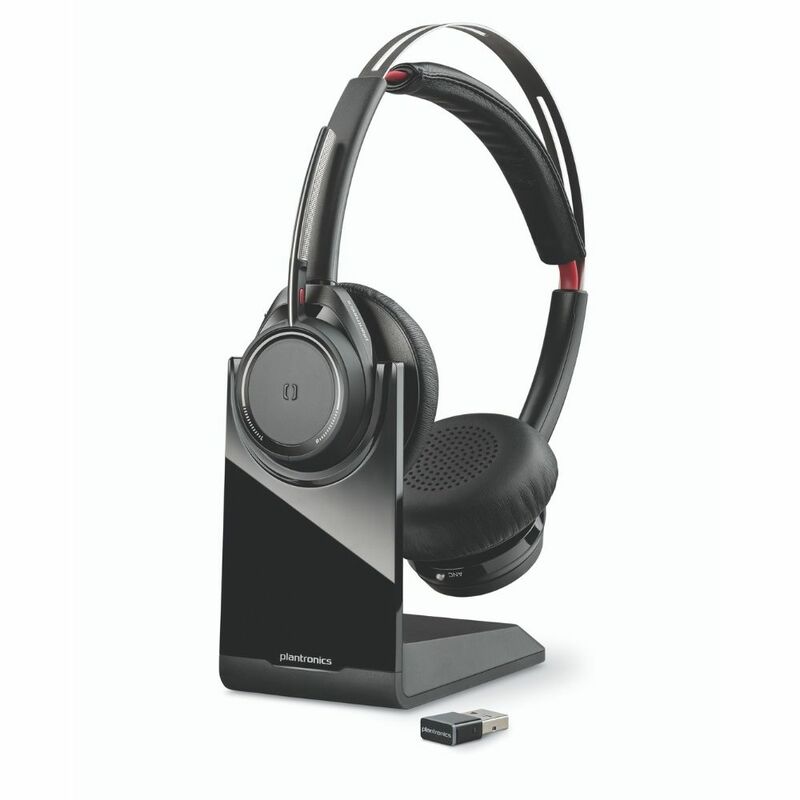 The groundbreaking active and passive noise cancelling and immersive stereo of the Voyager Focus UC headset enable you to concentrate on your calls or your music without distractions. With three precision-tuned mics and sophisticated muting options, your callers can concentrate on you, too. And when you need to pay attention to what's going on around you, just press the OpenMic button to focus on your surroundings. When it's time to crank up your music, the Voyager Focus UC delivers rich bass, crisp highs, and natural midtones in superior stereo. And it can take a cue—it pauses the music whenever you take the headset off, and resumes play when you put it back on. It can tell which way you're wearing it, thanks to the smart mic boom, so the stereo adjusts automatically. The volume and track buttons on the side do, too. So no matter how you wear it, you'll enjoy rich audio and convenient control at your fingertips. Control your conversations with intuitive mute capabilities and built-in smart sensors. Easily mute and unmute the mic with a quick touch of the dedicated button, or simply by taking the headset off and putting it back on—it knows whether it's on your head or not, and it responds accordingly. Music pauses automatically when a call comes in. You always know whether you're on mute—just glance at the screen* or the USB adapter to check the status. If you try to talk while your mic is muted, the Dynamic Mute Alert will give you an audible reminder. 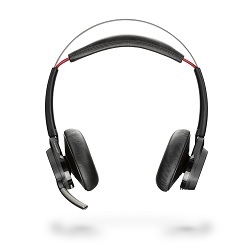 Voyager Focus UC—a headset that knows what's happening. 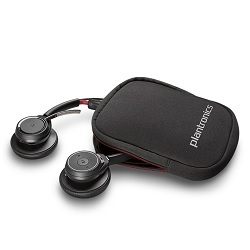 *Requires latest version of Plantronics Hub.